Scenes like this was normal to us. The quiet streets of Cairns now seemed strange to us. When we first set out on our trip, I was looking forward to having my first real culture shock. To a certain extent, our first stop Hong Kong was our first experience, mainly with the food. We had somewhat naively expected the food to be like our local Chinese takeaway at home. This was not the case; instead we were treated to chicken’s feet on street stalls and the smell of shrimp paste in the air. Donna also found herself to be a bit of a minor celebrity, with the locals all wanting their picture taken with her. 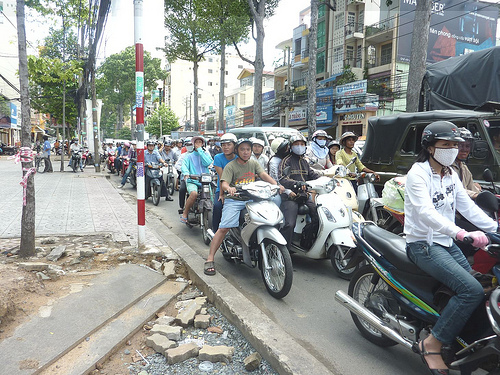 However, the first major culture shock of the trip for me was arriving in Hanoi, Vietnam. Everything there seemed alien to me; the sheer number of people, crazy traffic, sights, sounds, smells and general way of life. After the initial shock, we soon got used to it and grew to love it, which is why we chose to live and work there for 4 months teaching English. What was once strange to us, soon became normal. People got to know us; we navigated the crowds and millions of motorbikes with ease. We hopped on and off the back of a motorbike several times a day to go to work, the markets or the gym. We never had the desire to cook, nor had the facilities even if we wanted to. Why would you cook when you had the choice of cuisine from round the world on your doorstep, all for less than a couple of dollars. The Vietnamese were good at cooking not only their own cuisine, but cuisine from other cultures with ease. Bargaining and haggling became a way of life and less tedious as people got to know us. We got to know the Xe Om (motorbike taxi) drivers, Tam the fake book seller, the local street stall owner, restaurant staff and our Vietnamese family; TiTi, baby Louis, ‘laughy woman’ and ‘granny’, among others. Hitting the Goon (low quality cask wine). No more cheap beer. Alcohol is crazy prices in Australia, even more expensive than at home. Although I had read quite a few blogs on the topic of reverse culture shock, I wasn’t quite expecting to suffer from it myself. Our first taste of arriving back into ‘western’ culture was arriving in Cairns after spending 8 months in Southeast Asia. The first shock was just how expensive everything was, small bars of chocolate were $2 to $3, and small bottles of water were $3. An even bigger shock was the price of alcohol, where a bottle of cider in a bar cost $12. It was blatantly obvious to us that the days of 40 cent beers were well and truly behind us. Obviously, we knew things were going to be more expensive than Asia, but we were still shocked as just how much more expensive it was. We had quickly gone from living quite comfortably in Hotels and Guesthouses for $3 – $10 each per night to sharing an 8 bed dorm for $20 – $30 each per night. Arriving in Cairns, we were surprised by how little traffic there was. All the cars obeyed the rules of the road, stopped at traffic lights and adhered to the speed limit. We had gotten so used to constantly dodging motorbikes, weaving in and out of heavy traffic and walking on the roads due to the pavement being blocked with bikes. It was probably more noticeable because we had went from heavily populated Asian cities to the relatively sleepy town of Cairns. Crossing the road was a breeze, because it seemed like the roads were practically empty. 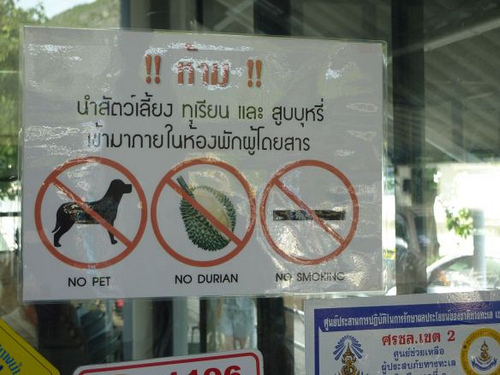 Durian was a popular fruit in Asia, but it smelt so bad it was banned in many hotels and public areas. It was a sensory overload going from A to B in Asia, from the smell of fish sauce or Durian, motorbikes with 3 seater sofas balanced on the back, hawkers all shouting for your attention and people everywhere. By comparison Cairns seemed a little dull. Where were all the people? Why were there no hawkers? Where were the millions of bikes? It seemed old habits from Asia also died hard. I was so used to removing my flip-flops before entering many buildings in Asia that I was slightly embarrassed when I instinctively kicked off my flip-flops before entering a dive shop in Cairns. Opening hours also seemed bizarre to us. Shops opened from around 10am and closed again at 4pm (or earlier if the owner could get away with it). Was this what it’s like at home? In Asia most places opened from early in the morning until at least 10pm. Infact, most of our trips or journeys were booked late the night before. It seemed that were were going to have to be a little more organised in Australia. As it turns out this seems quite common in most towns in Australia. The bigger cities tend to have more extended hours and open late (until 9pm) at least once a week. The people also seemed less friendly, don’t get me wrong, they weren’t unfriendly but we were no longer greeted with beaming smiles and friendly questions. Nobody seemed to care who we were, where we were from, where we were going, how we got here. The naturally friendly and inquisitive nature of Asians was replaced with slightly more guarded Westerners. 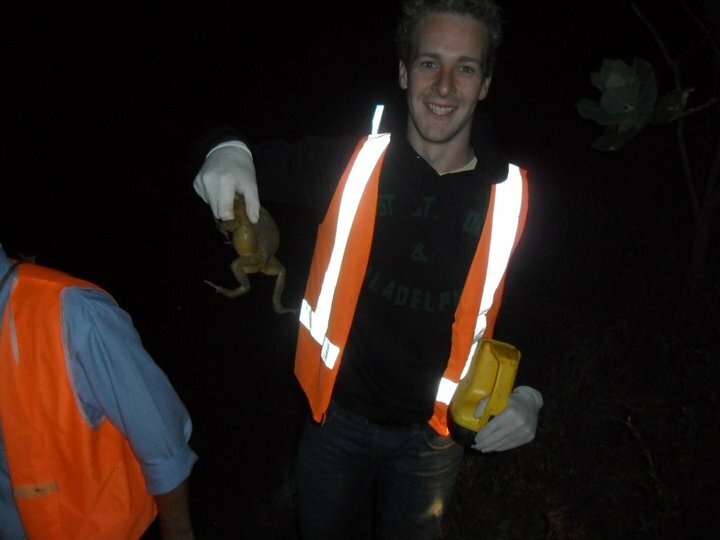 Catching Cane Toads. Just another normal day in Australia. The comparisons with Asia continued for a few months as we adapted back into Western society. Now, 10 months after first entering Australia, I have went from being a bit Asian to being a bit Aussie. I’m more laid back now and I usually reply to questions with ‘No worries’. What next? Wrestling Crocodiles while shouting out the word ‘Crikey’. I would rule nothing nothing out any more. I’ve done so much that I never thought, or even knew I could do. Some might say that I’ve become a bit of a Yes Man. catching cane toads and getting stuck in the outback overnight being just a couple of note worthy, and equally random things that I’ve done. All of which will be covered fully in a blog shortly. This is the western world but not as I knew it. Needless to say, I may have to prepare for reverse culture-shock part 2 when I do eventually return to the homeland. Glad to know someone is still reading them. I need to update more often. It’s been ages since my last blog. How are you guys doing back in the UK? 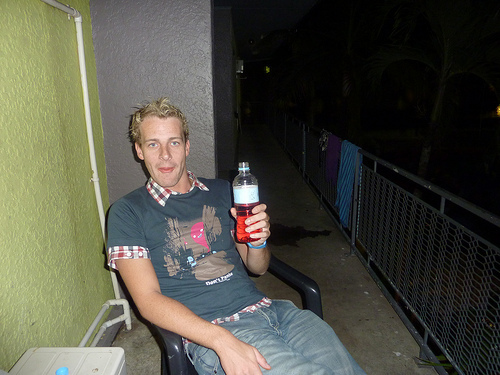 Any plans to revisit Australia?